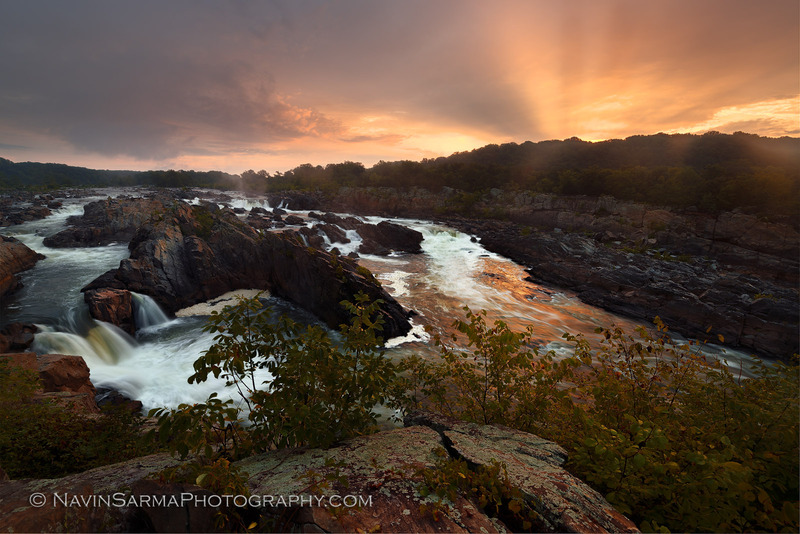 This past Saturday morning, I taught another photo workshop, this time at Great Falls National Park, on the Virginia Side. If you’re interested, contact me or join my meet up group here. After waking up to a couple sprinkles in Washington, D.C., and my workshop participants curious to cancel the class, I had us press forward. As a general rule, I won’t cancel unless it’s calling for constant pounding rain. Soon after 530, clouds began to break and showed a small window to the moon. Occasional drops and lightning in the high clouds quickly gave way as the horizon began to glow. As the sun rose, a few crepusculars danced amongst the golden pinks and purples. The gold was nicely reflected in the rushing water from the Maryland side. Goes to show that it pays to get out there and shoot, even when it looks like “bad” weather! em>A golden pink sunrise at Great Falls National Park, VA.